What a thrill soccer is!! From a fan point of view this was a great game to watch, but for us coaches it was a tense second half. During the first half we had more ball possession than the other team, but we did not take as much advantage of it as desired since Westminster was always faster to get to the divided balls not letting us have game continuation: we started several plays, but we could not finish them as we wanted. We were fortunate to score a goal early on the first half from a beautiful kick from Olivia. She crossed the ball to the opposite side of the goalie and there was nothing she could do to stop it. The second goal, also from Olivia, was very similar, a shot from mid-distance aimed to the perfect spot. 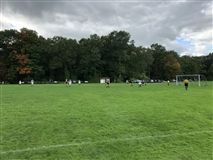 Our team realized that the goalie had trouble stopping the ball from mid to long-range balls and Alyssa scored the third goal also from outside the penalty area. 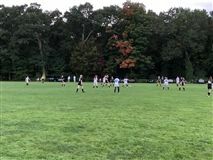 After the third goal, Westminster had some good chances of scoring by passing the ball behind our defense and having two or three of their fastest players trying to create a 1v1 or 2v2 situations, but either our defense and our goalie were able to stop their chances. Towards the end of the first half Ellen did not give up on a ball and, as a result, one of Westminster's defenders scored on her own goal when she was trying to clear the ball. Two things happened to us on the second half: we changed the goalie and we started a little bit more relaxed. 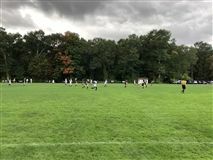 Westminster was able to score three goals and the end of the game was nerve-wracking, as we tried to defend but were not organized on the field, and Westminster was pushing to score the fourth goal. But we were able to contain them and finish the game with the win.